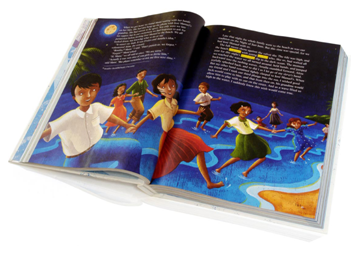 Reading － The core of the Language Arts curriculum for the immersion program is called StoryTown. The stories are thematic with a focus on comprehension, vocabulary development, phonics/spelling and grammar. Students from Grades 1-3 also use a supplemental home reading program called PM Readers. Students in Grades 4-6 use a paper and digital versions of SRA ? an independent reading program leveled by reading difficulty and lexile reading measures. Students also check out appropriate leveled picture and chapter books from the school library and the classrooms have books available to the students as well. All students are required to read English language books throughout the year and record their reading in Reading Logs. 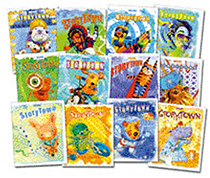 Spelling － Spelling lists at each grade level are derived from the StoryTown stories and Katoh’s 2400 Vocabulary Word List. Students are asked to practice writing the words and write the words in sentences for homework. Writing － Each student in the Immersion Program has a Writing Portfolio. Writing pieces are generated in many different subjects throughout Grades 1-6. Students go through the entire writing process, which includes using graphic organizers to plan their writing, rough draft writing, the editing process and final copy writing. In Grades 5 and 6, timed writing from a given prompt in also used. Students write in their weekend journals for homework. Oral Language － Academic and social language functions are taught to the students throughout the year. Students have opportunities to pair/share, show and tell, and make presentations. Teachers use a vast repertoire of Immersion strategies in the classroom to produce oral language.